Smaller and short-haired dog breeds often suffer from temperature drops more than we might realise, and keeping them warm is imperative for their health and happiness. Even South African summers have chilly nights, so investing in insulation for your dog kennel to keep him comfortable all year round, is a smart choice. Follow these easy guidelines to maximise your best friend’s comfort in cold weather. Our real estate friends often remind us that the most important things about a house are location, location, location. This is even something to remember when you’re thinking of your furry friend’s house. 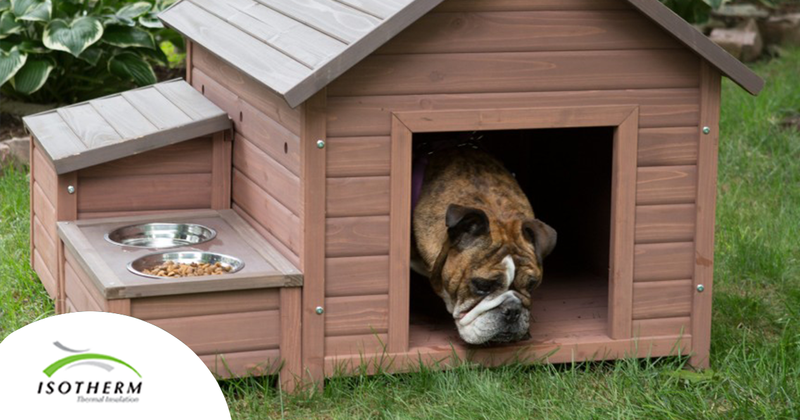 The first step is to find the best spot to put your dog house. On the stoep or under a roof overhang will let the kennel benefit from the shelter afforded by your house. You home will create a barrier against the wind and rainfall, reducing the effects of cold temperatures. Make sure the entrance to the kennel is not facing the wind, and bear in mind any eddies that might swirl around sharp corners and enter the kennel. Keeping the kennel raised off the ground (for example, on a verandah) will also reduce the cold seeping up from the ground, and avoid flooding when it rains. This will also help protect the structure of the kennel, as well as its resident. An important part of dog kennel insulation is layering. A cuddly puppy blanket will only go so far if it’s the only thing in the kennel. A good stack of clean, dry blankets keep your dog warm and comfy. Further than that, a layer of foam or a dog bed or basket inside the kennel will increase the warmth of the interior as well. There is no need to buy an expensive dog bed, however; if you have an old baby mattress or even some throw cushions, you dog will have a soft and warm bed to call his own. Insulating the kennel’s structure is also important. If your dog kennel was not made with existing insulation in the walls, as most aren’t, there are easy ways to do this yourself. You can use practically any material to insulate the interior walls of the kennels. Any old carpet off-cuts, blankets, bathmats, Styrofoam or plastic sheeting can be nailed or staple-gunned to the walls to increase the insulation of the kennel. If you want to splurge, you can buy insulation sheeting in a variety of thicknesses and roll sizes at most home and building warehouses. To avoid toxic materials and possible allergies or skin reactions, consider ISOTHERM’S all-natural insulation, which can be attached easily and quickly to your interior kennel walls for maximum thermal insulation. You might be having nightmares about the fact that all these layers and extra blankets are creating a breeding ground for fleas, bacteria and other pestilences. Insulation materials such as ISOTHERM are resistant to condensation, and all the fungi and bacteria that need it to survive. Ticks and fleas tend to die in cold temperatures, so their presence is minimal during winter, but regular cleaning and airing out should keep these pests completely at bay. The outside of your dog kennel may also need insulation. Kennels made from wooden planks especially tend to let drafts and rain in through the cracks. It may not be visually attractive, but plastic sheeting or any waterproof and wind-resistant material can be used to cover the exterior of the kennel. On a larger budget you can find pleasantly coloured or patterned materials to brighten the appearance, or if you have some sewing skills you could even make a fitted cover that can be slipped on and off as needed. For added insulation, extra material could be used as a flap or curtain over the entrance as a wind barrier. Just remember that insulation should not compromise the flow of fresh air through the opening or make it difficult for the dog to move around. With these simple, easy and cost-effective methods, you can do your own dog kennel insulation. Your pet’s comfort is of utmost importance, and keeping them warm in the cold seasons will ensure both their comfort and their health. A dog kennel should be considered a home, and don’t forget to throw in some of their favourite toys to keep them entertained as well.